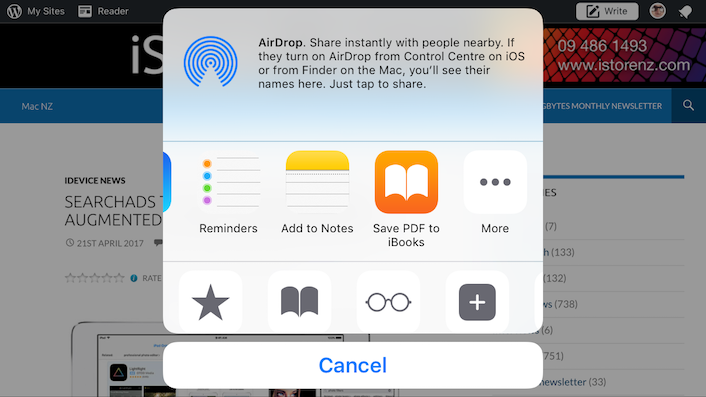 1/ Print to PDF from any app from iPhone and iPad — This trick relies upon a hidden feature of the Share Sheet. 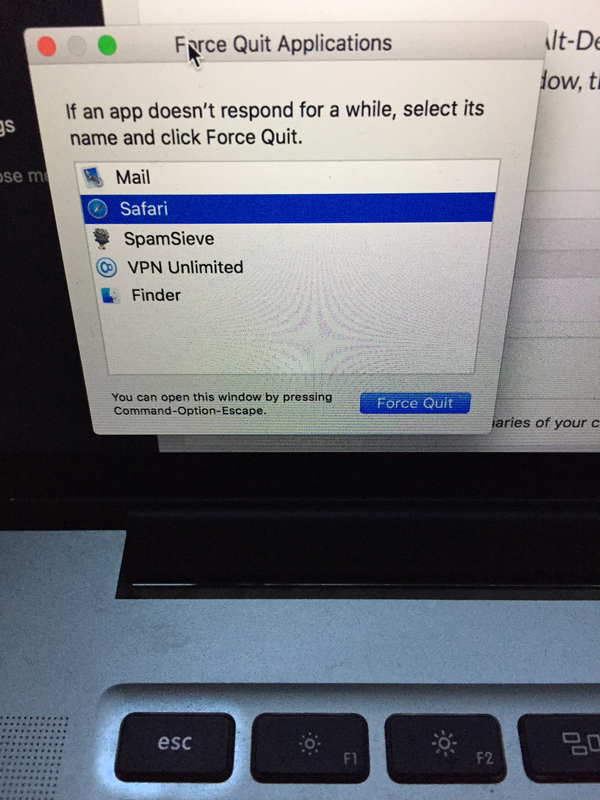 To print from any app, such as Safari, you begin by tapping the Share icon. Next, tap the Print icon from the bottom row of the Share Sheet. Depending on what you’ve enabled, you might have to scroll to the right to find it. Now, to access the PDF view, simply 3D Touch (or pinch together two fingers to zoom out, in no0n-3D Touch devices) in the preview area of the PDF. With that done, you should be in a PDF view of your document, web page, or whatever. Your next step is to share it. Just tap the Share icon, and choose where you want to send your PDF. You can share it via Messages or Mail, or any other app that supports the Share Sheet extensions. Another great option is iBooks, if you want to keep all of your PDFs together, but there’s often a Share Sheet icon there to do that directly. But you can even save the PDF file to your iCloud drive or Dropbox. Saving the web pages you’ve visited to PDF is a great way to keep notes when you’re researching. Other options for where to save those PDF files include Evernote and even the built-in Notes app. 2/ Use the Remote app to control your iTunes library in macOS Sierra with your iDevice — If you have an iPhone, iPad or iPod Touch you can use the Apple Remote app — free from the Apple App Store — to control your Mac’s iTunes library from a distance. First, pair the app with the iTunes library (or libraries) you want to control. Your device and your computer must be on the same wireless network. If you have Remote 2.0 (or later) and Home Sharing is turned on, you can set Remote to pair automatically with any of the iTunes libraries on your Home Sharing network. You can also pair Remote directly with iTunes libraries that aren’t in your Home Sharing network. To pair the Remote with an iTunes library: Tap Remote on your device’s Home screen. Tap Add an iTunes Library. Open iTunes on your computer and click the Remote button . Type the 4-digit code in the iTunes window. iTunes pairs the library on your computer with the Remote app on your device. Pair Remote with your Home Sharing network. To use Remote 2.0 (or later) with Home Sharing, every iTunes library you want to control must have Home Sharing turned on. Tap Remote on your device’s Home screen. Type your Apple ID and password, and tap Done. 3/ Use Home Sharing to import items from another iTunes library — You can use Home Sharing to import items from up to five iTunes libraries on other computers on your home network? You can (assuming you have an Apple ID). When you use your Mac on your Home Sharing network to download an item from the iTunes Store, you can have the item download automatically to other computers on your Home Sharing network. Turn on Home Sharing. Choose File > Home Sharing > Turn On Home Sharing. Type in your Apple ID and password, and click Turn On Home Sharing. If you don’t have an Apple ID, click “Don’t have an Apple ID?” and follow the onscreen instructions. To import items from other libraries using Home Sharing, choose a computer on your Home Sharing network from the Library pop-up menu. The library loads and a list of categories appears. Choose a category (Music, for example). In the Show menu at the bottom of the iTunes window, choose “Items not in my library.” Select the items you want to import, and click Import. To automatically import new iTunes Stores purchases from another computer, choose a computer on your Home Sharing network from the Library pop-up menu. Choose a category (Music, for example). Click Settings at the bottom of the window. In the window that appears, select “Automatically transfer new purchases from Library Name.” Select the types of items you want to import. Click OK.
To turn off Home Sharing, on each computer, choose File > Home Sharing > Turn Off Home Sharing. If a shared computer doesn’t appear when Home Sharing is on, turn Home Sharing off, and then turn it on again. 4/ Disable homescreen rotation on Apple’s Plus-series iPhones — By default, Apple’s iPhone 6 Plus, 6s Plus, and 7 Plus add an auto-rotating home screen to iOS, rearranging icons and the dock whenever a device is tilted sideways. 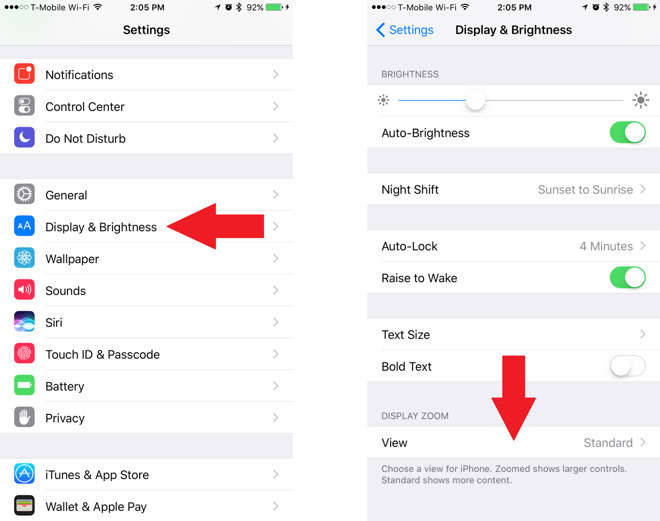 Within the Settings app, tap on Display & Brightness, then on “View” under the Display Zoomcategory towards the very bottom. Nominally this option just makes it easier to browse and tap on icons. As a consequence of using it, however, the home screen will no longer rotate. To make the switch, tap on ‘Zoomed,’ then on ‘Set.’ Technically an iPhone has to reset to apply the change, but unlike a normal reboot this should only take several seconds. That’s it — to reverse course, go back to the Display Zoom menu and select ‘Standard’ instead. The above method works in iOS 9 and 10. The first time you 3D Touch anywhere on the keyboard, you can start dragging the cursor around to place it in a specific spot. It’s a great way to get exact placement without fidgeting with your finger. 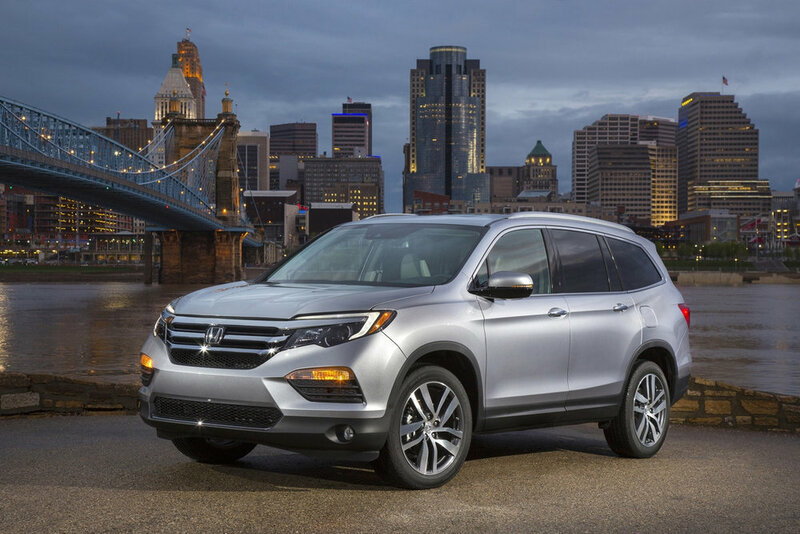 2017 Honda gets enhanced Apple CarPlay support — Honda has announced fresh updates to the award-winning Honda Pilot for the 2017 model year. It will now be available with Apple CarPlay and Android Autofunctionality, a new fingerprint resistant touchscreen and an expanded interior color palette. Record Bird keeps you up to date on artist new releases by scanning your Apple Music library — Record Bird is a free iPhone app that allows users to be informed about new and upcoming music releases from their favorite artists. And this week it was updated to add support for Apple Music, making it easier than ever to be in the know about upcoming album releases. Record Bird version 1.3 is now available on the iOS App Store, adding Apple Music integration, alongside previous support for Spotify and Facebook. By granting access, Record Bird can scan artists in a user’s library from all three services, automatically adding them to a list of followed artists. iPad Pro ad highlights its use as a computer — Apple’s new iPad Pro commercial, iPad Pro — What’s a Computer? is like a Microsoft Surface Pro spot except with slicker production. 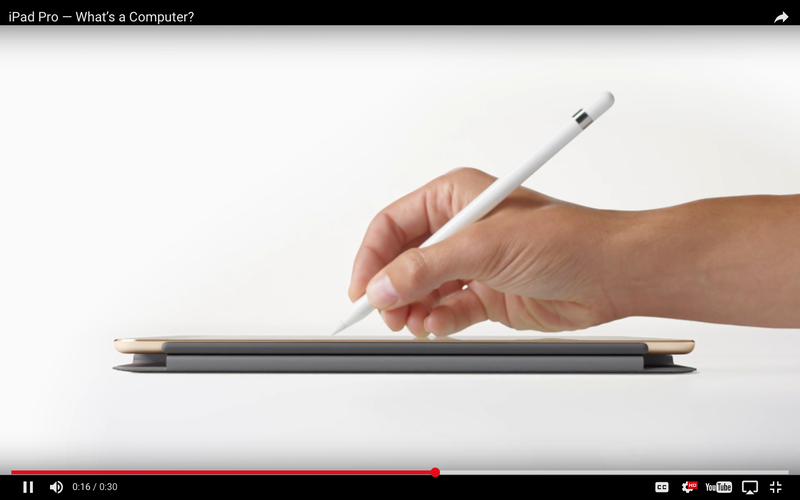 It pitches iPad Pro as a computer, only one you can touch, type on it, plus write on it using a stylus. It features iPad Pro (9.7-inch), Smart Keyboard, and Apple Pencil. You can capture that elusive Charizard, and without PokéVision. Macworld tells you how. Apple Intros Apple TV Remote App for iOS — Apple is finally bringing the Siri remote’s features to the iPhone and iPad with its new Apple TV Remote app. The app lets users control their fourth generation Apple TV as if they were using the device’s included remote, and supports Siri voice control, too. It also supports the second and third generation Apple TV sans Siri control, but can’t control iTunes on your Mac. For that you’ll still need the older Remote app. Apple TV Remote is a free download at Apple’s App Store. FileMaker Inc unveils Small Business Toolkit and Idea to iPad Bundle — For small businesses struggling to go digital and mobile, FileMaker Inc, the wholly owned subsidiary of Apple, has released the Service Business Toolkit and Idea to iPad Bundle. Apple now licensing OpenTV streaming technologies, ends worldwide litigation — An agreement has been forged between Apple and the Kudelski group, with Apple paying to license a suite of media streaming patents, to conclude an international patent battle. Apple has released updates to all of the iWork apps — The updates (also for iOS) primarily do two things: provide bug fixes for compatibility with Microsoft Office documents and make the apps more stable. The Mac update fixed an issue in Keynote when exporting presentations as images, and another with master slides that included links. Pages on the Mac (NZ$24.99 or free on all Macs released in the last 18 months) can now open some Microsoft Word documents that were previously impossible to open, plus it resolves an issue that prevented the use of Look Up for words in lists. Numbers can now open more Microsoft Excel spreadsheets. How to use Up Next on iTunes — iTunes and the iOS Music app both offer Up Next, a way to queue up music you want to listen to. They work in very similar ways, allowing you to add music to the Up Next queue, change the order of tracks in the queue, and remove specific songs from Up Next. Let’s take a look at how to use Up Next in iTunes and the iOS Music app. Helen Keller award for VoiceOver — Congratulations to Apple for receiving the Helen Keller Achievement Award for VoiceOver. The accessibility feature reads what’s happening on a device’s display out loud, enabling vision-impaired to use Apple’s devices more easily and successfully. How to test your Mac for a hardware problem — Modern Macs have a built-in diagnostic test that can be used to help troubleshoot a hardware problem. The technology has changed over the years, and the procedure is determined by how old your Mac is. Loads of Mac games on sale — That’s at GameAgent. There are dozens, and some are only a couple of dollars. Apple addresses XARA vulnerabilities, says fixes on the way — Apple on Friday commented on the discovery of so-called cross-app resource access (XARA) exploits, saying it rolled out a server-side security update earlier this week and is currently working with researchers on additional fixes. More Photos Q&A: imports hanging, what is safe to delete, and sharing to Facebook — Photos is the app that won’t stop until it drops. More answers to your questions about working through missing features and potential bugs. How Apple should revamp iTunes (for the better this time) — The launch of Apple Music means a new version of iTunes. Dan Moren has some ideas. There is no more free Single of the Week in iTunes. List of HomeKit products from CES — So far all we have seen of HomeKit is promises from June 2014; there wasn’t a way to take advantage of it until iOS 8 shipped, and even now virtually nothing utilises HomeKit. But that’s slowly starting to change: CES 2015 was the first wave of hope for Siri-friendly home automators. Traffic from Apple’s unannounced iOS 9 grows into new year — Testing on Apple’s anticipated iOS 9 release continues to ramp up at the start of 2015, with the next major iPhone and iPad operating system expected to make its official debut at the annual Worldwide Developers Conference in June. Minecraft: Pocket Edition — Minecraft: Pocket Edition is bigger than Texas, 23 times hotter than the Sun, and “more than the entire observable universe.” Of course, if you’re looking for actual statistics, Mojang has one of those, too: the number of times the pint-sized version of the game has been purchased is 30,000,000! Google’s Chrome Remote Desktop app lands on iOS — Google Chrome has a lot of fancy features built-in or available through extensions. One of those awesome additions is Chrome Remote Desktop — but until this week, the feature was limited to computers running the Chrome browser itself or Android devices. Now, however, iOS users can get in on the remote desktop action as well. Train for a marathon like a pro with these apps — There’s no single app that can absolutely take you from lazy couch potato to marathon finisher, there are several apps that can help you in your quest to run the absurd distance of 26.2 miles. Because marathons are so taxing, even the most seasoned runners still need to train—constantly. Scannable app supercharges Evernote scanning on the go — Scannable for iOS delivers quick and easy scanning to Evernote with a minimum of configuration. Whether you’re snapping Post-It notes or capturing business cards, Scannable is intended to make it as fast as possible (and get it all into Evernote, of course). It’s free. 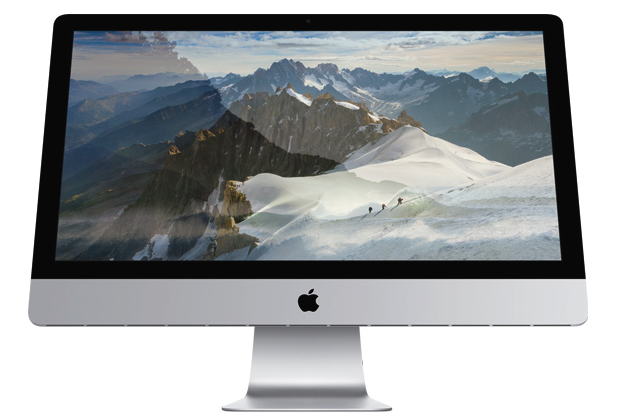 The Retina iMac (image from Apple Inc). Apple’s new 27-inch Retina iMac — Apple certainly has a talent for making people lust after products they previously didn’t know they wanted; such is the case with Apple’s new 27-inch Retina 5K iMac. TUAW has a roundup of early reviews. A teardown of the new 27″ Retina iMac reveals identical parts, construction as the last-gen model– apart from that utterly gorgeous 5K screen, of course. Yosemite! What you need to know — TUAW has posted ‘the only Yosemite review you need to read‘ and Macworld has ‘The Complete Guide‘; the Mac Observer has ‘Cool stuff found in Yosemite Notes‘ (it’s a podcast); new OS feature iCloud Drive allows OS X Yosemite users to store any type of file in the cloud; and how to get phone calls on your Mac in Yosemite. Handoff in OS X Yosemite makes it easy to transition between your Mac, iPhone & iPad; How to use Mail Drop and Markup to send large emails in OS X Yosemite; and How to place and answer iPhone calls on your Mac with OS X Yosemite, plus ‘OK, Mac’: Using Automator’s Dictation Commands, new in Yosemite. Apple has posted the full October Media Event video. Take Control has you covered too, with Take Control of Upgrading to Yosemite, Yosemite: A Take Control Crash Course, and Digital Sharing for Apple Users: A Take Control Crash Course. Apple patches OS X to protect against POODLE — Apple yesterday issued a security update for OS X Mavericks and Mountain Lion meant to protect Macs against possible POODLE attacks. Macworld runs down everything you need to know about iCloud security — The key takeaways here are that yes, you should absolutely be using Apple’s two-factor authentication – here’s how to set it up, by the way – especially now that it offers extended protection to iCloud and your backups. iWork Updates for OS X, iOS Add iCloud Drive Support, more — Thursday’s release of OS X Yosemite brought along big updates for Pages, Numbers and Keynote for both the Mac and iOS devices. The updates for Apple’s iWork suite included iCloud Drive and Handoff support. The iLife suite for Mac has app redesigns, OS X Yosemite support. Adobe Lightroom plug-in eases transition from Aperture, streamlines photo library imports — Seemingly timed to coincide with the launch of OS X Yosemite, Adobe on Thursday announced availability of a Lightroom plug-in that streamlines the process of importing Aperture photo libraries. Where is my sidebar in iTunes 12? — Apple support boards are chattering today about the graphical changes in iTunes 12. The beloved, or in some cases tolerated sidebar is pretty much gone. 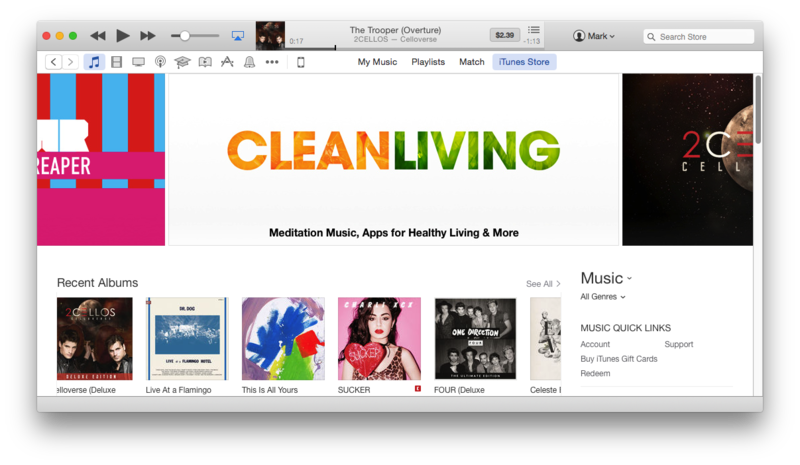 Your music, movies and devices are now a row of icons at the top left of the iTunes window. All is not lost, however: your playlists can still appear in a left-side column as usual, making them quite easy to manage. 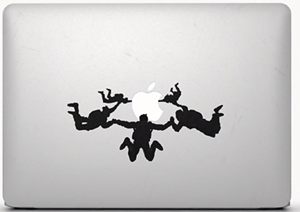 New Apple ad shows off sticker-clad MacBook Airs — The ad calls the Air ‘the notebook people love’: Apple has published a short 30-second commercial featuring a number of MacBook Airs dressed up in stickers and decals, with each customised thin-and-light reflecting the personality of its owner. You can watch it at Apple Insider. Intel rolls out faster Haswell CPUs possibly bound for MacBook Pro refresh — Intel on Sunday released a batch of new Core i5 and Core i7 Haswell processors for high-end laptops like Apple’s MacBook Pro, each boasting the usual speed bumps when compared to prior versions. Apple issues MacBook Air EFI update to address wake from sleep problems on mid-2011 models — Apple on Monday posted an EFI update for its thin-and-light MacBook Air, addressing two wake from sleep issues including a rare problem that causes the computer’s fans to spin at full speed unnecessarily. Apple’s MacBook Air EFI firmware update 2.9 targets problems seen on mid-2011 models running OS X 10.9.2 and later. 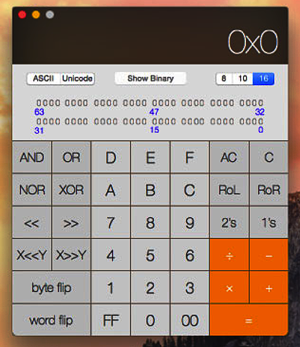 OS X Yosemite Preview 4 brings redesigned Calculator, updated Dark Mode — Alongside a host of bug fixes, the latest developer preview of Apple’s next-generation desktop operating system brought a few small but noticeable visual tweaks to some of OS X’s oldest components, including a redesigned Calculator. Apple releases iTunes 12 beta with ‘elegant new design,’ Family Sharing — Alongside new beta versions of iOS 8, OS X Yosemite and numerous development tools, Apple on Monday released a preview of iTunes 12 sporting what the company calls an “elegant new design” and support for the Family Sharing feature introduced at WWDC. Marked 2.3 arrives in the Mac App Store — Marked 2 has finally hit the Mac App Store. Previously only available via developer Brett Terpstra’s website, the update has now officially replaced the original Marked in the Store. Version 2.3 introduces a number of new features to the preview app for markup languages.